I’m super excited to announce the next blogger in Stories Behind the Shelves. Which you already know from reading the title, but we’ll just ignore that and you my lovely readers are kind enough not to mention it! *Drum Ruffle* Ruby from Feed Me Books Now! This blog is one of the blogs that I adore and have been following for a long time -as in I followed this blog before I became a book blogger myself. I love Ruby’s blog, it’s super cute and she has designed it herself! I am so happy that she wanted to participate and as expected her post is totally awesome, its a big Divergent reference (Bonus points Ruby! Big bonus points! haha). So I’ll just stop talking and let you read the awesomeness that is Ruby’s bookshelf. Books on this shelf: Clockwork Angel, The Book Thief, The Girl in the Mask, To Kill A Mockingbird, Paper Towns, My Sister Lives on the Mantel Piece, That Burning Summer, Midwinterblood, Mockingjay, I am the Messenger, Out of the Easy, Looking For Alaska, The Pocket Scavenger, Catching Fire, The Fault in Our Stars, The Drowning, Legend, Shadow and Bone, Let It Snow, Killing Woods, Seraphina, The Hunger Games, Daughter of Smoke and Bone, Days of Blood and Starlight, The Coldest Girl in Coldtown, The 5th Wave, Divergent, Insurgent, Breathe, Friday Brown, The Elites, Throne of Glass, The Moon and More, All I Ever Wanted, Between Shades of Grey, The Knife of Never Letting Go, The Ask and the Answer, Blood Red Road. Fun fact about this shelf? Back when I first moved into this room, my friend was helping me organise my books onto the shelves… and she ended up borrowing about half of my YA books! Disadvantage: my babies were gone. Advantage: Someone to fangirl with. Fun fact about this shelf? When I was shifting my books from my old room into my new room, I actually had double the amount of books than those which are on these shelves… I must have read much more in primary school than I remember! The books I didn’t want were given to charity shops so I managed to whittle the number of my childhood reads down to just over a 100. Books on this shelf: Atonement, Captain Corelli’s Mandolin, Why Be Happy When You Could Be Normal?, Animal Farm, Great Expectations, The Unlikely Pilgrimage of Harrold Fry, Life of Pi, Moonwalking With Einstein, The Odyssey, On the Road, On Chesil Beach, The Odd Women, When Will There Be Good News?, One Good Turn, Started Early Took My Dog, Before I Go to Sleep, A Short History of Nearly Everything, A Little History of the World, One Good Turn, Behind the Scenes at the Museum, Emotionally Weird, The Colour Purple, Wise Children, Treasure Island, David Copperfield, The Old Curiosity Shop, Rebecca, The Kite Runner, The Diary of a Young Girl, 1984, Ideas That Matter, Wuthering Heights, Pride and Prejudice, Autobiography. Fun fact about this shelf? 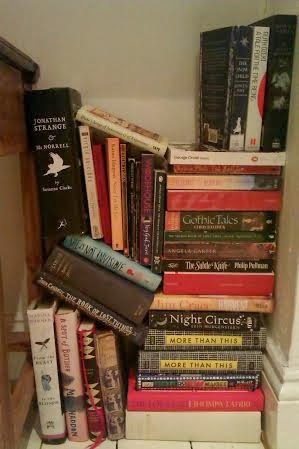 My shelves lead all the way up to the ceiling of my room, and this shelf is at the very top… meaning that when I want a book from here, I have to stand on a stack of books on top of a stool! Sorry for standing on books but I’m relatively small for my age – okay! Books listed on this shelf: The Snow Child, A Tale For the Time Being, The Secret History, Jonathan Strange & Mr Norrell, Blake’s Poems, The Virgin Suicides, Lyra’s Oxford, Never Let Me Go, The Testament of Mary, A Haunted House, A Room of One’s Own, Vey Good Jeeves, The Hound of the Baskervilles, George Orwell Essays, The Bell Jar, The Elegance of the Hedgehog, The Magus, Gothic Tales, The Virago Book of Fairytales, Angela Carter, The Subtle Knife, Anna Karenina, Harvest, The Night Circus, More Than This, We Need New Names, The Lowland, The Luminaries, Grimms’ Fairytales, Hans Christian Anderson, A Spot of Bother, From the Beast, The Book of Lost Things, Ulysses, She is Not Invisible. Fun fact about this stack? It’s my favourite out of all of my shelves because, unlike the others, it can only grow… well, until I get a new bookcase. It also has a lot of my favourites on it – The Snow Child, The Night Circus and A Tale For the Time Being to name a few! Yay a fellow Hufflepuff! Why does no one want to be Hufflepuff? We are by far the best, lol. Ha I’m the same with lending my books! I’m SO careful with my books that I don’t want to lend them out xd Let alone my favorites! I don’t want them to come back with cracked spines and all. There are very few people who proved they are worthy of lending my books haha. 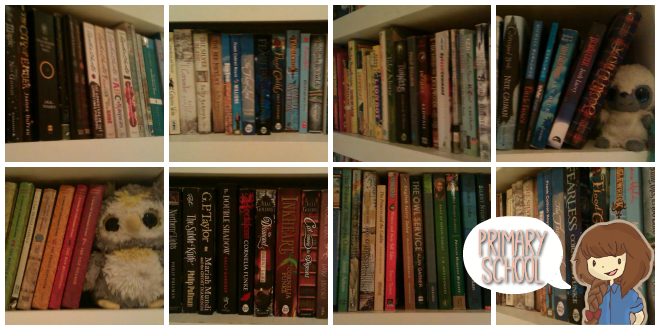 I really like how you organized your YA shelf, like the same colors next to each other! And I’m jealous of your library.